The loops-process defines a specific way in which musical parameters gradually transform during the repetition of one or multiple musical cells. A motif - or the residue of a previous motif - launches a succession of transformations acting on different musical parameters. These transformations are gradual and fragmented, thus always referring to the former motif within a constantly changing musical evolution. A succession of transformations creates a period. The quality of the period is dependent on the overall direction of the transformations. 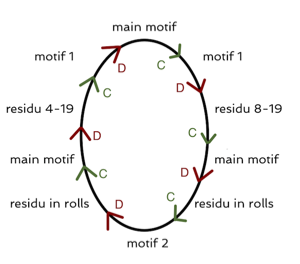 A loop contains a combination of periods that connect residues and motifs. The interactions between the loops define the structure of the overall composition. A specific terminology is introduced for the analysis. By re-ordering the score in a vertical way, the different steps in the process are more visible. In every example a constructive element is marked in green, while a regressive element is marked in red. The different transformations and the division in periods and loops is a way to provide a structural framework for the composition. This framework is reflected in the clicktrack tool to support the practice of the score. Every transformation of a specific musical parameter holds two directions: constructive or regressive. The difference between constructive and regressive directions is clearly marked by opposites: a constructive transformation is building up a musical cell by the use of that specific parameter, while a regressive transformation is dismantling the cell by the use of this specific parameter. The table below shows an overview of the different musical parameters and their directions. Click on each parameter to find a more detailed description of the transformation. A melody can grow by addition or gets reduced (diminution) in its length or by its amount of notes. A melodic addition often occurs combined with a rhythmic diminution: a melody - which contains rests or is constructed out of large note values – is being gradually filled up with smaller note values without changing the length of the motive. Together with additions the melodic curve of one or multiple cells develops from capricious to fluent. Capricious means that the curve is less defined and will contain larger interval leaps between few notes. A fluent curve holds smaller interval leaps between more notes. In that way the curve gets more defined, because each part is outlined by more notes. Changes in the melodic curve, together with a rise and decrease in range are always obtained in two ways: on the one hand a note can be changed with 1, 2 or 3 semitones, on the other hand a note can be transposed with an octave. Both changes can also happen simultaneously. A rhythmic diminution will transform a rhythm into a smaller value, which will raise the density of the entire rhythm in a motif. A rhythmic augmentation will transform a rhythm into a larger value, which will lower the density of the entire rhythm in a motif. The harmonization of a melody is mostly combined with an augmentation in rhythm, while a ‘melodisation’ of a passage in chords occurs together with a diminution in rhythm. Constructive and regressive transformations are translated in accelerando and ritardando. An accelerando as a constructive transformation results in a faster tempo and usually leads to a motif. A ritardando results in a slower tempo and usually leads to a residu. A constructive direction in dynamics is an increase of volume, a regressive direction in dynamics is a decrease volume. A series of constructive dynamic transformations is a crescendo and results in a louder dynamic. The end of the transformation is often the loudest dynamic in that period. A series of regressive dynamic transformations is a diminuendo and results in a softer dynamic. A constructive direction in range gives a gradual ascending of the motif. A regressive direction in range gives a gradual descending of the motif. The rise or decline of the range and changes in the melodic curve are always obtained in two ways: on the one hand a note can be changed with 1, 2 or 3 semitones, on the other hand a note can be transposed with an octave. Both changes can also happen simultaneously. The ambitus will become larger in a constructive transformation, and will get smaller in a regressive transformation. A constructive transformation will evolve towards more legato phrasings: notes will be connected under a slur or will be more sounding (e.g. more open pedal in Loops II). A regressive transformation will lead to more staccato phrasings: notes will be less sounding and more detached, holdsstaccato marks, are more separated by - short - rests, etc. A loop is the largest structural element in the composition. It contains a succession of a constructive period towards a motif and a regressive period that leads to the residue of the motif. Within the analysis a loop is marked with a number. 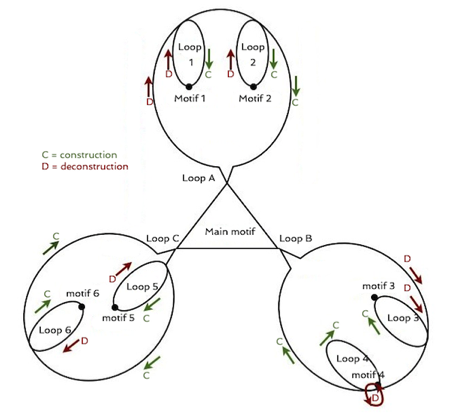 Multiple loops can be combined into an overall Loop, which is marked with a letter. A motif is the center part of each loop. It acts as the ending point of a constructive period and thus is the most ‘completed’ form of the repeated cells within that loop: a motif has for example the most added components in the melody, the most fluent and defined melodic curve, the most dense rhythm and the fastest tempo. It will be high in range and contains a large ambitus at a loud(est) dynamic and legato phrasings. The motif is the starting point for a regressive period. During this period regressive transformations will dismantle the previously formed motif until a residue is left. This residue is opposite to the motif: it will often hold lesser elements in the melody, a wider rhythm, a less defined melodic curve, a smaller ambitus in a lower range and a (most) soft dynamic with more staccato phrasings. The residue acts as a starting point for a new constructive period and thus launches a new loop. The loops process highly influences the overall structure of the composition. During the series of Loops-compositions, Philippe Hurel adds new elements to the transformations. This results in a new structural form in each composition. The introduction of a main motif - a motif acting as a corner stone for each large loop - is an important addition to the process. It creates new possibilities in musical evolution and inspires every subsequent addition. Continuous transformation and variation are more and more integrated into the development of the compositions and influence the larger structure. The table below shows an overview of the different overall structures for each composition in the series. Loops I introduces the specific transformations. It has a linear structure in three parts. Each part contains a loop. The composition doesn’t contain a main motif. Loops II introduces the main motive. This motif acts as a starting and ending point of each of the three loops. Loops III contains overlapping of periods within a network structure. Loops V is constructed again a linear structure, but without independent parts. The parts are marked in the score, but they are connected to each other. The process functions as an underlying principle for a continuous composition. The structural plan of the loops-compositions is often similar. The beginning introduces the main motif. The corpus of the composition holds three large loops, which can contain smaller loops. The composition often ends with a coda. The beginning and ending of the - large - loops is often marked with short pauses. The division into measures is parallel to the different steps in the transformations. This leads to a busy metrical structure, often containing irregular and interpolar meters. The gradual changes in rhythm - defined by the direction in the rhythmical transformations - explain this specific difficulty in the score. On the other hand the tight mapping of the motifs onto the measures makes it possible to create a rotation: a transformation which shifts the - metric - accent within a motif.